Put together a combination of prepared and homemade dishes for a casual night under the stars. I recently enjoyed “movie night” in Chicago’s Millennium Park with a group of friends. The entire evening was a lot of fun and, as always, there was plenty of food. We sort of had a pot luck with everyone bringing a little something to share. The wonderful spread, including my friend Leland Couchman’s avocado and white balsamic seafood dipping sauce, inspired me to share a few ideas for your next picnic in the park. Many of these ideas either began with prepared items to which I added a few things, or are very simple recipes that require minimal preparation. The focus of an evening like this should be relaxing and enjoying a casual night in the park with friends as opposed to spending a lot of time doing prep work in the kitchen. Also, because it’s an outdoor event away from home, I’ve used plasticware, disposable containers, paper plates and individual mason jars for added convenience and easy clean up. Place shrimp and salmon on a serving platter and wrap with plastic wrap and keep chilled until ready to serve. Pour capers into either a small disposable container or 4 ounce Mason Jar and set aside. Make the avocado dipping sauce by placing the avocado, lime juice, dijon and balsamic in a blender or food processor and blend until smooth. If you are using a large avocado or it isn't overly ripe, you might need to add a bit of water to get a smooth creamy consistency. Transfer to the same type of container as the capers. To make the second sauce, combine the barbecue sauce, hot sauce and minced shallots. Squeeze the juice from one of the lemon wedges into the mix and transfer to another small container. Put the remaining lemon wedges into a fourth container. When ready to serve, simple unwrap the seafood and open all four containers and allow guests to serve themselves. 1/4 lb Prosciutto, thinly sliced then cut into strips about 3" x 1 1/2"
Place about 1/4 tsp of brie cheese on the cut surface of a date half. Wrap with a slice of prosciutto and secure it with a toothpick. Place in a sealable container until ready to serve. Skewer a tomato and slide it about 3” down. 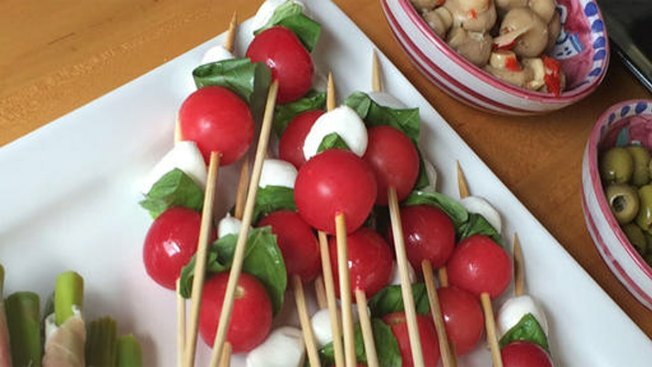 Fold a basil leaf in half and slide it onto the skewer up against the tomato. Add a mozzarella ball and slide it up against the basil leaf. Place skewers in a sealable container until ready to serve. Mix together chicken salad, carrots and grapes and place in a sealable bowl. Gently remove 6-8 (or more) leaves from the lettuce. Rinse them and let them dry. Place the leaves in a sealable plastic container and keep chilled until ready to serve. To serve, allow guests to simply spoon a portion of chicken salad into a “lettuce cup” and wrap it around the filling. Mix together mascarpone, vanilla, heavy cream, powdered sugar and cinnamon and set aside. Remove the stems from the strawberries. Stand the strawberry upright and slice it vertically, creating 3-4 slices. Fill about 1/3 of each mason jar with strawberries. Top the strawberries with about 1/4 of the mascarpone mixture. Add more strawberries to reach the 2/3 mark in the jars and then top with another 1/4 of the mascarpone mixture. Fill the jars with the remaining strawberries and top with fresh mint and seal. Keep chilled until ready to serve. To serve, simply open the jars and eat with a spoon. Each jar can be shared or enjoyed by one person. Thanks again to Leland Couchman for his contribution to this segment. If you have any comments or questions, please send me an email at wayne@waynesweekend.com or follow me on Facebook or Twitter.